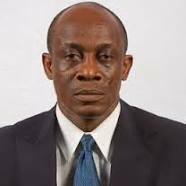 The Minister of Finance, Seth Terkper, presented expenditure estimates in pursuance of Article 180 of the 1992 constitution which provides that, "where it appears to the President that the Appropriation Act in respect of any financial year will not come into operation by the beginning of that financial year, he may with the prior approval of Parliament by a resolution authorize the withdrawal of money from the Consolidated Fund for the purpose of meeting expenditure necessary to carry on the services of the Government in respect of the period expiring three months from the beginning of that financial year or on the coming into operation of the Act whichever is earlier." The Rt. Hon Speaker referred the request to the Finance Committee, which deliberated the matter and reported back to the House. The House suspended Standing Order 80 (1) with deliberations assisted by the Hon. Minister for Finance, the two deputy Ministers of Finance, Mr. Cassiel Ato Forson and Mrs. Mona Quartey and officials from the Ministry of Finance. The Member of Parliament for Bosomtwe, Hon. Simon Osei Mensah, raised concerns about e government borrowing and bemoaned the conditions attached to such loans, saying, that they tend to "slow the developmental process of the country". Contributing to discussions on the estimates, the Deputy Finance Minister, Mona Quartey stated that contrary to that assertion, the rate of growth of debt in the country is in fact, decreasing and so it is imperative to put all those factors into perspective when deliberating on government’s revenue and expenditure.